After 17 years of working from our fantastic converted loft from our sunny south facing house in North London Neil and I took the plunge to buy a very old and dilapidated warehouse 10 minutes from our home. It had to be done as there were 8 people troupzing up our stairs to work every day and it had come to the point where we were bursting at the seams. So when a strange looking rather tired pinky building appeared on one of my many searches for industrial properties within 10 minutes from our house, we were intrigued to see what sort of building it was and why it hadn’t sold in over 18 months. The estate agent was useless and went out of his way to put us off the building which made it even more desirable. “The Works” turned out to be a two storey 1890s converted stables which was part of Europe’s biggest dental factory in Barnet, North London. Neil and I were smitten on first site of the building as indeed were the rest of the Eskenzi PR team. The building was quirky, huge and had masses of potential to expand, infact, with 2600 sq ft we could expand 5 times before we would fill it and then probably still have room for lodgers, friends and other hangers odd bods, so unperturbed we put in a ridiclous offer which was amazingly accepted and we bought it! It’s now 8 months later and we’re still not in the building. That really shouldn’t come as a surprise to anyone who has done building work, infact I went to see a clairvoyant during the Jubilee celebrations at the beginning of June and she told me that we wouldn’t be in our new building until March 2013! I laughed and told her that was ridiculous. How right she was, how wrong was I! I don’t believe in fortune tellers – but it did spook me out a bit when the first set of builders fell through and the next builders told us we wouldn’t be in until March almost 10 months after buying the building. We’re totally gutting it and lovingly breathing back life into a very neglected weary building. 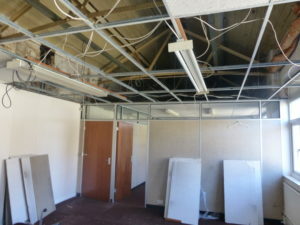 What was a damp, dark building which had been split up into disgusting 1970s grey office cubicles with low, plastic ceilings has been opened up into one big open space. Within the next 2 weeks we’re going to puncture 12 huge holes into the ceiling and put in massive lovely skylights. I just can’t wait – it’s the perfect way to start 2013 with a fantastic building project to get my teeth stuck into. Once the windows are in and there is more to show you I’ll post up some more pictures.